Yellow Ted Baker Logo Clasp. Blue Patent with Gold Tone Hardware. Minor defects, Dent / Chip on Clasp. Back zipper slot. Snap closure, rose gold Ted Baker logo across the front. it fits in jeans ,and u can put in anywhere in a jacket because of its size. adorable makes a perfect gift for the girl/lady who has everything. Style: robot. Type: long wallet. Material: leather. Color: black. FASTENER AND KISS CLASP CLOSURE. ORGANIZER, ID HOLDER, AND SLIP INTERIOR POCKETS. Foldover front flap with snap button pocket - Top bobble push-lock closure - Interior features 1 I.D. window, 11 credit card slots, 1 slip wall pocket and 2 slip pockets - Approx. 4" H x 7.5" W x 1.5" D - Imported. Beautiful Ted Baker Bobblehead Black Patent Leather Wallet. It is new, never used with tags. It has a couple of very minor scratches but they are barely noticeable. What you see on the front and back of the wallet is dust. I couldn't get the scratches to even show in the photos. The interior is pale pink leather. NWT Ted Baker Pearly Petal Wallet. Condition is New with tags. Shipped with USPS First Class Package. Ted Baker leather travel wallet. Received as a Birthday gift in April 2019. Brand New with price label. Shipped with USPS Priority Mail. COLOR: NAVY. SIZE : O/S. Aletha Versallie Bobble wallet. Patent black leather exterior. 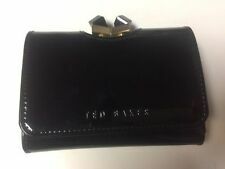 1C2 Ted Baker Continental Leather Zip Back Clutch Patent Women Wallet Card Slots. Condition is New with tags. Shipped with USPS First Class Package. Brand new, comes with tags attached and card as shown on photo Retail price $149 Black Color Leather Gold tone hardware It features: exterior zip coin pocket; interior 4 bill compartments, 1 slip compartment, 11 card slots and ID window. Approx. measurements: 7.5”L x 3.6”H Please look at photos and read the description carefully before the purchase! Please study all photos, they are the part of the description. If you have any questions about the item please contact us and we will answer them shortly. Milissa Kyoto Gardens Bobble Matinee Wallet. Color: Mid Blue Multi/Rose Gold. Exterior zip pocket, two interior slip pockets, 12 interior card slots, interior ID window. Floral print and debossed logo detail on front flap. Ted Baker pink patent leather wallet. Usage as shown. Originally $159 Purchased from Ted Baker store nyc. Includes box and dust bag. Holds so much. 12 card slots. Will last you for years and goes with everything. 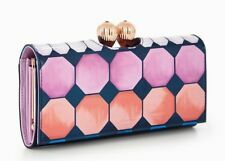 Beautiful New Ted Baker Jewelry Pouch. Zipper pockets for jewels. This would make a perfect gift for a mom,wife, girlfriend, daughter, bridesmaid, granddaughter or buy it for yourself. Everyone needs a travel pouch for their jewelry. Shikra Textured Leather Oyster Card Holder ~ Black, Rose Gold Hardware. Travel in style with Ted’s SHIKRA card holder. Adorned with a delicate bow detail, this handy design opens up to reveal five card slots, including space for photo ID. Crafted from beautifully textured leather, this luxurious wallet from Ted Baker features a sparkling crystal, embellished double bobble clasp for a glamorous touch. The wallet is completed with an exterior zipped pocket to the back. Bright Pink Smooth Leather. front flap and snap closure. Exterial: Leather Construction, Bow Hardware Detail. Interior: ID Window, Card Slots, Bill Slot. Ted Baker Tyro Wallet Crystal Bow. Condition is Pre-owned. Has some staining on the front of the wallet only, and a crack on the side as pictured. The rest is in great condition. Thistle Travel Lifestyle Organizer. zip closure. Color: Rhubarb. Includes four car slots and ID window. 5" shoulder drop. Wrist strap has a drop of 5" and a lenght of 6". Four multi-function pockets. Gently used wallet by Ted Baker. ted baker wallet Condition is Pre-owned. Shipped with USPS First Class Package. Gorgeous Auth Ted Baker large bag. It’s an amazing looking bag. It fits a lot. Interior currency and slip pockets: 11 card slots: ID window. - Stunning with artistic floral print with a gleaming kiss-clasp crystal closure in rose gold. - Rose gold hardware. Color Burgundy. Snap wallet. Credit Cards and change. SALES ARE FINAL! Whimsical and useful coin purse from TED BAKER! Round silhouette designed with color blocked cat features. Gold-tone printed cat face on front, gold-tone hardware. Leather; lining: polyester. Tad baker’s iconic Chelsea Border print of stunning white and pink roses;. Keep your jewelry safe and sound while traveling;. Interior: lined, and 2 zip pockets;. Snap-flap closure;. The wallet features Overall fair/subpar condition. conditions below for a reference of the condition and the wallet. Smooth patent leather build. Why buy from Brain Sunglasses and Accessories?. NWOT Ted Baker London Patent leather wallet. Brand New With tags. Beautiful Red Patent Leather and Pink interior lining. In mint condition. Retail price $149 dollars. Ted Baker Leather Large Wallet Excellent condition, like new! No return accepted! Thanks for looking! Ted Baker Wallet. Patent leather exterior and white leather lining with gold-tone hardware. Pls refer to pictures - slight marks on the interior but still very cute. Lots of credit card pockets. Shipped with USPS First Class Package. 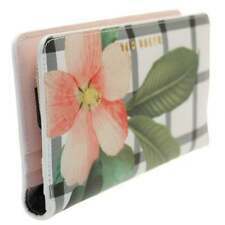 Ted Baker Heleff Tile Floral Matinee Wallet New Fast Shipping! TED BAKER HELEFF TILE FLORAL CROSS HATCH MATINEE WALLET. Ted Baker’s signature floral lining completes the interior look. The exterior displays Ted Baker’s logo rose gold lettering and zipper with rose gold T pull tab. Ted Baker Kassady Black patent wallet. New without tags. Originally $149.00. Features genuine patent leather, gold-tone hardware, snap closure, zippered pocket on rear exterior, a lovely heart-shaped kiss clasp closure to that secures your loose coins, interior slip pockets, seven (7) card holder, photo I.D. holder, and a cream-colored cowhide leather interior. Ted Baker London Tammy Textured Leather Bobble Matinee Wallet, Pink, NWT!